Do not be bamboozled by Donald’s forked tongue. 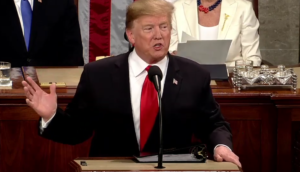 Last night, in his State of the Union address, he was full of talk of reconciliation and compromise and building a brighter future for all: “Together, we can break decades of political stalemate. We can bridge old divisions, heal old wounds, build new coalitions, forge new solutions, and unlock the extraordinary promise of America’s future. The decision is ours to make,” he said. But every day, via his climate denial, he erodes that future. That global climate crisis becomes ever more apparent by the day. Also today, the British Met Office predicted that we are in the middle of what is likely to be the warmest 10 years since records began in 1850. If that was not scary enough, two days ago, a landmark report highlighted how a third of the huge ice fields in the Himalaya could melt due to climate change, affecting almost 2 billion people. That is right: 2 billion people.